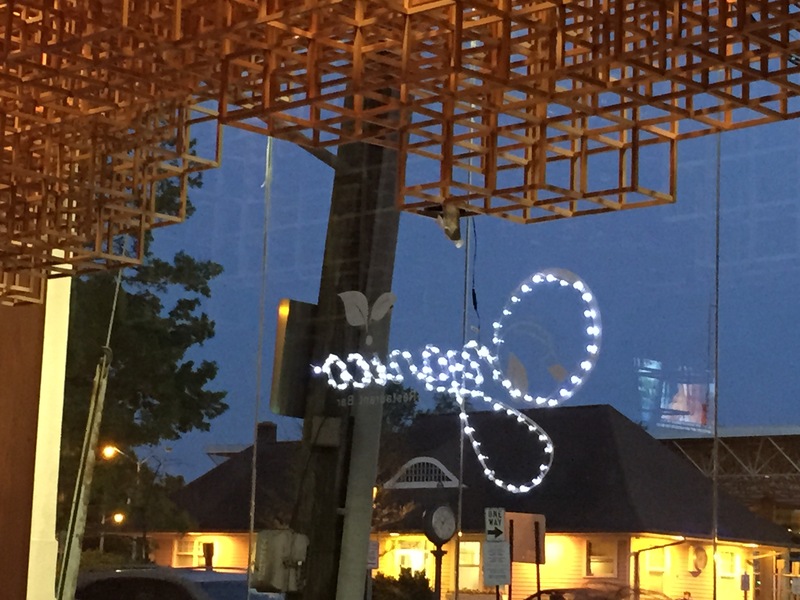 This sign hangs in the window of a restaurant in town. From the outside, it reads ‘Organico’. From the inside… anyone see what I saw? Must be a full peninsula of Magnets for the Absurd. No lie. This baby was lying at the curb down the block from my house today. 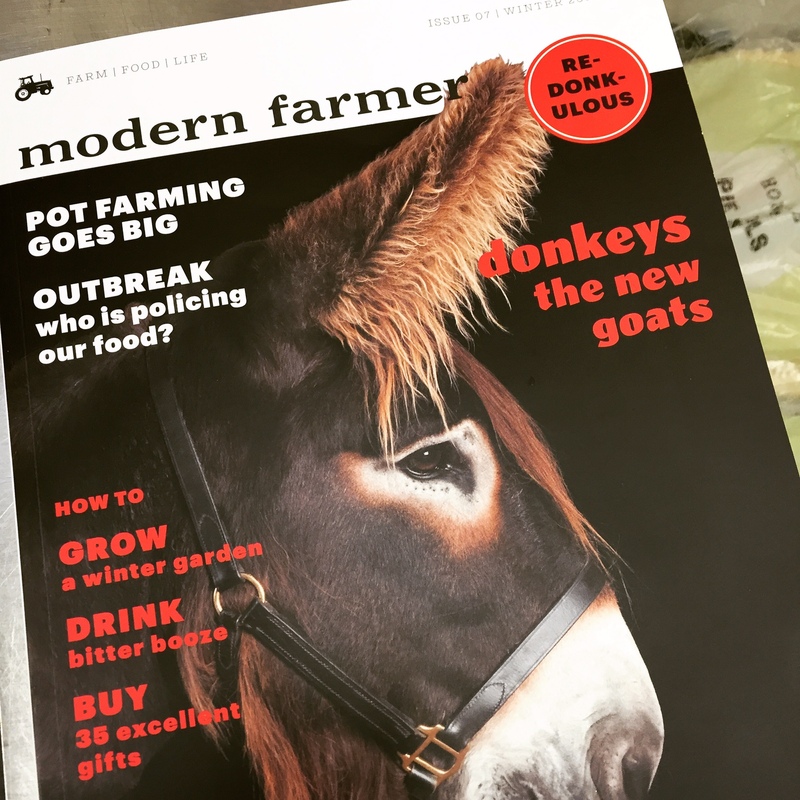 If you are a regular reader, you know I have an affection for things left at the curb. I am not sure if my neighborhood is simply ripe with refuse, or if all neighborhoods are like this but people just don’t notice. Or they notice but don’t document. 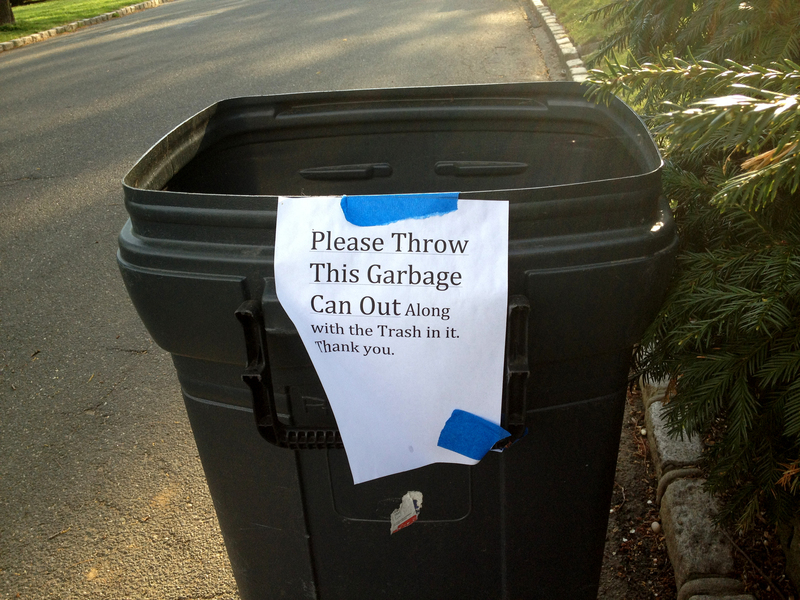 My garbage posting has gotten to a point where I am thinking of starting a garbage blog. Thoughts? So this item was found outside a house that has new residents. The previous homeowners predate my family and we have been here 24 years (how can that be, this was my starter house). I am thinking that I am falling in love with these new neighbors before I have even met them. 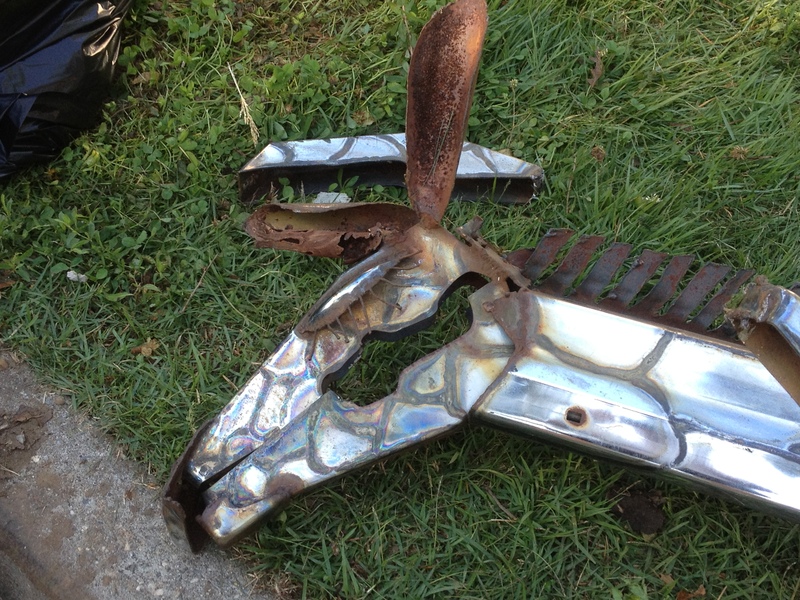 If you are having trouble making out what this is, it would be a very large metal sculpture of a giraffe; one that looks as if it was hit by a car. This sucker was huge. I would say certainly the size of an actual baby giraffe. Here is a shot of just the face. I simply love the eyelash detail. So, my dear readers, I put this question out to you, was this an item that the new owners found in the house, or was this something they moved with and then decided they no longer wanted? 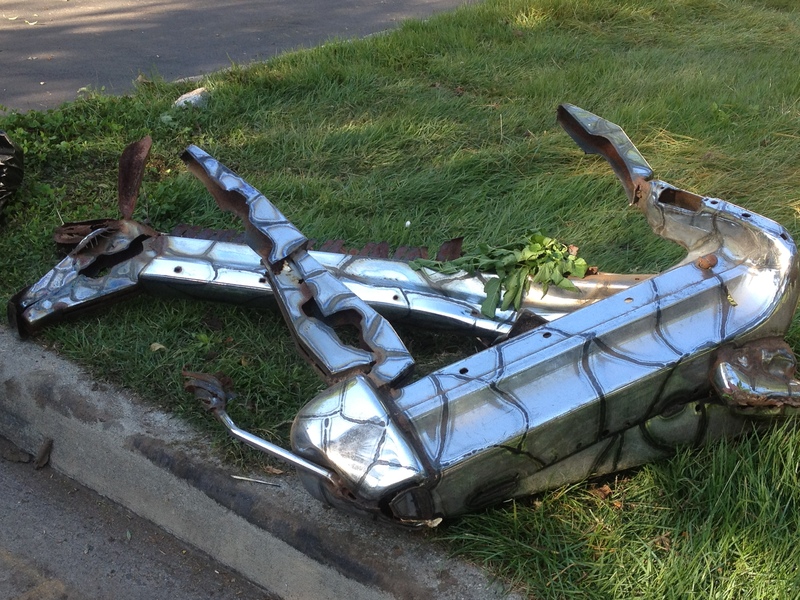 Or perhaps they had all intentions of using it as a lawn ornament but the movers destroyed it. It’s been a while since we took a poll, so let’s put it out there. All you lurkers who don’t like to comment, go ahead and vote, it’s anonymous. Is it possible to throw out a garbage can? If you are a regular reader you know my unhealthy obsession fascination with other people’s garbage. I am not sure if it is my neighborhood or the fact that I walk every morning before the garbage is picked up, but I have found some of the most amazing things sitting by the curb. I need to do a garbage round-up post soon so you can see what I mean. Today I came across this gem. Monday is not a garbage day in my neighborhood. The last pick-up was Saturday. Which means that these people have left this here in hopes that tomorrow’s collection day will bring them some luck. Is it an undocumented phenomenon that it is literally impossible to throw out a garbage can? Notice the contents are gone but the can remains; even with a clearly marked note on the can. Are they not allowed to take the can or is it a big FU for not tipping at the holidays? I have tried to do this before. It is not easy to get these guys to take the can. And this one seems to be in great shape, other than being sans lid which I am guessing is what is rendering it useless in the land of cats and raccoons. I suggest first making a more elaborate sign, maybe one with some humor to catch their attention. Or maybe standing outside when the truck comes and begging. Or perhaps taping a little envelope to the signage with some incentive in it and a clearly marked dollar sign. Just another sunny afternoon walking through Soho. 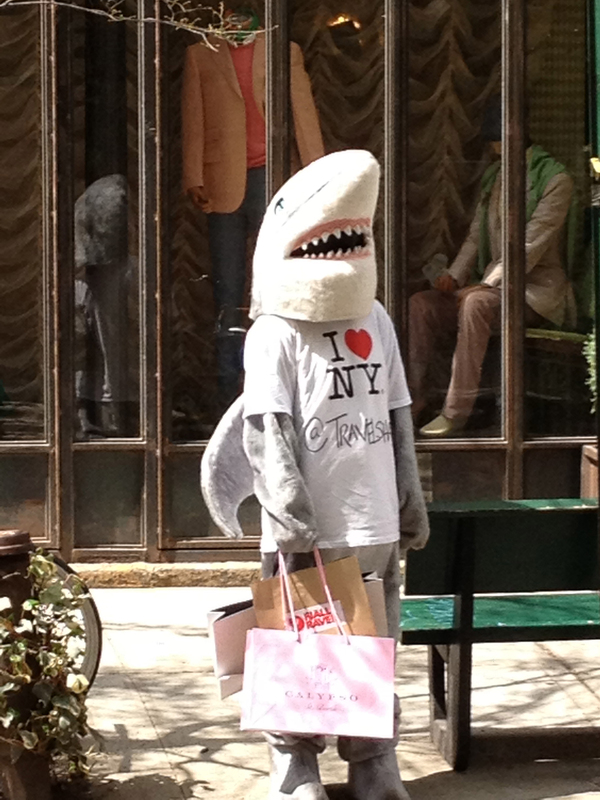 Hey, even a land shark needs to shop once in awhile. And this one was trendy at that… a Calypso bag! Gotta love a shark with a big budget. I am sorry I did not catch the full twitter handle on his shirt. I consider it a gift of the universe when I walk out of a parking garage, rushing between meetings and I come across something like this. This happens to other people, right? I am pretty sure I heard him muttering under his breath ‘Plumber, ma’am’, but I could be mistaken. No, I did not set this picture up. What kind of pervert do you take me for? This gift from the MFTA gods just happened to be in a little store window in Williamsburgh as we were walking from drinks to dinner the other night. I love the Mac Mini box he is sitting on. For those who are not familiar with Pee Wee Herman, he had a kids’ show from ’86-’91 called Pee Wee’s Playhouse that was a big hit. That crossed over into my early child-bearing years but for some reason I remember us watching this before we had kids. He had sort of a cult following of 20-somethings that were simply amused by his humor. 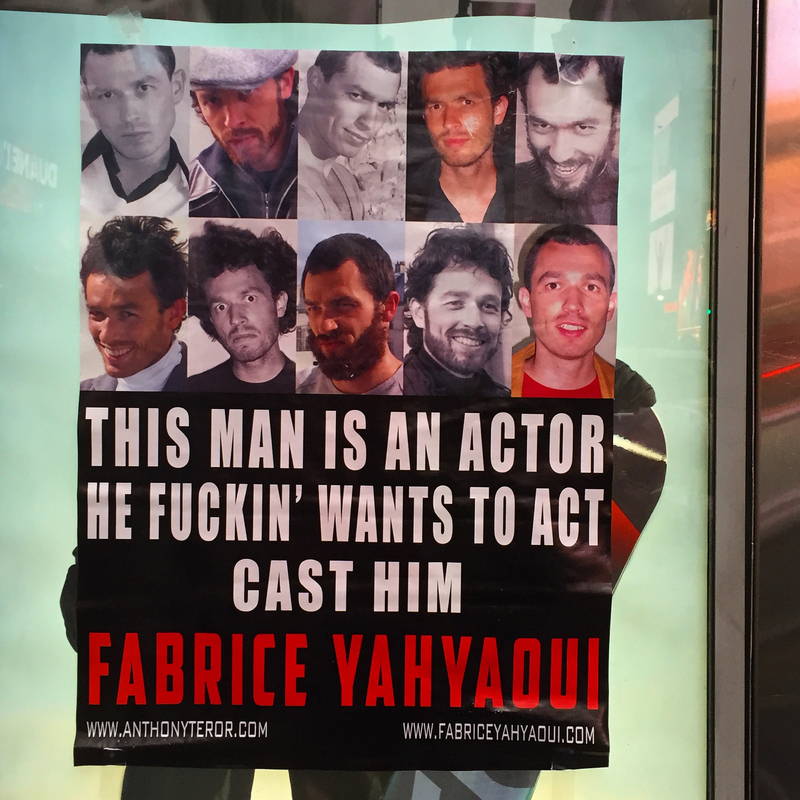 His other claim to fame had to do with a popcorn container with a hole in it at the movies. 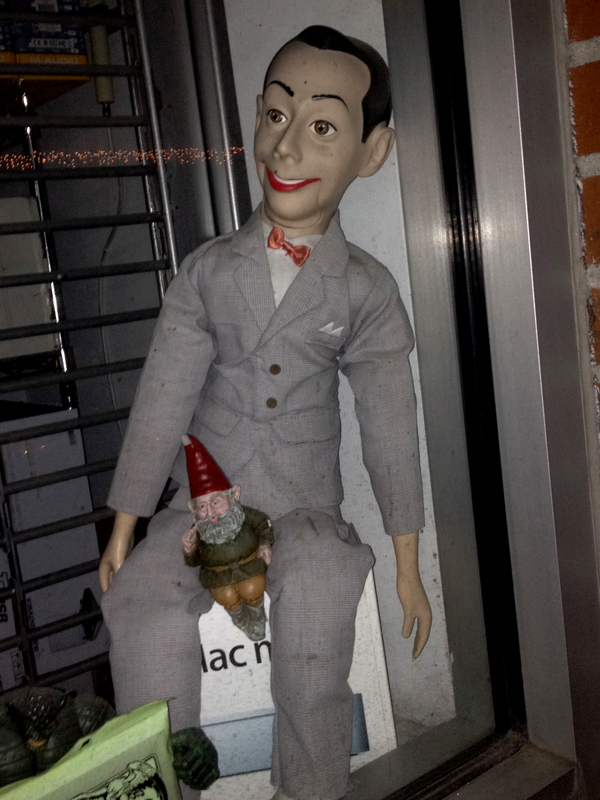 Whoever set-up the gnome in the crotch window display surely remembered that scandal. And to think, I almost passed right by this one!